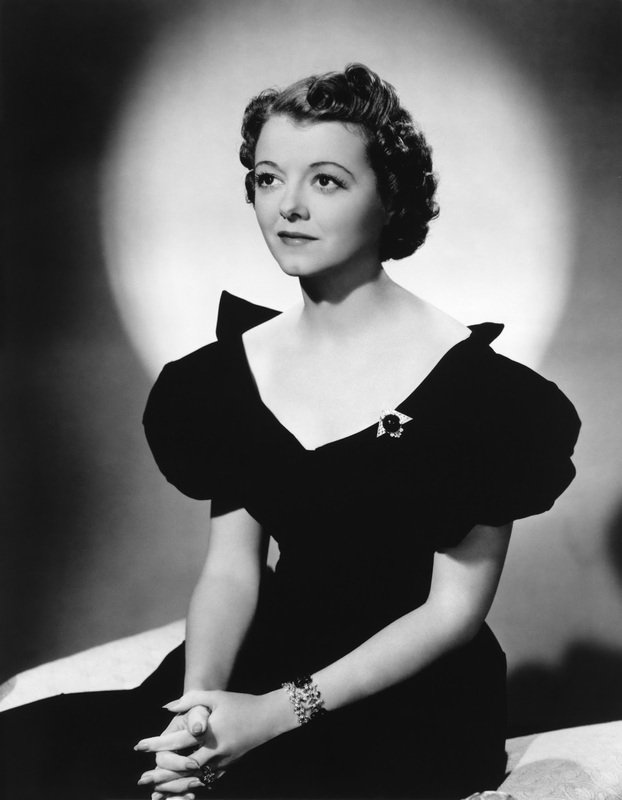 A Star Is Born (1937), starring Janet Gaynor, is one of the 1001 classic movies you should see. Each Monday, I'm going to recommend a classic movie you should see (for the reasons behind the 1001 series and reviews of earlier films covered go here). January's theme is movies about Hollywood. Today's selection is the first version of the often-filmed drama A Star Is Born (1937). A Star Is Born tells the story of Esther Blodgett (Janet Gaynor), a Dakota farm girl who sets out for Hollywood with dreams of becoming a movie star. At first, she meets nothing but failure -- an unsentimental casting agent (Peggy Wood) tells her that her chances of making it are one in a million -- but eventually she strikes up a romance with matinee idol Norman Maine (Fredric March) who helps her get a contract with producer Oliver Niles (Adolphe Menjou). Esther, who is now renamed Vicki Lester, and Norman eventually marry, but he becomes increasingly despondent as her career rises and his falters. The origins of A Star Is Born are somewhat cloudy, but the plot came from an original story written by director William Wellman and writer Robert Carson that was based on several real-life incidents in Hollywood (more on that below). In his typically grandiose style, independent producer David O. Selznick decided to go all out for the production, casting a bevy of big name stars and well-known character actors, and making the movie in Technicolor using real Hollywood locations. The result was a huge critical and box office success that launched two successful remakes (yet another version in the works, this time starring Bradley Cooper and Lady Gaga). In many ways, A Star Is Born served as a guide for all of the wannabe Esther Blodgetts in the audience who were looking for their big break in Hollywood. They learned where to stay (a boarding house that is conveniently located near the studio), how to get their foot in the door (try serving at cocktail parties), and what happens after you get your big break. In exchange for fame and fortune, newly minted stars could expect to have their names changed, their looks criticized, and their private lives dissected in the fan magazines. 1. 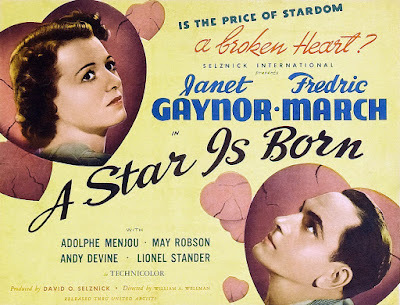 1954 remake.The Judy Garland-James Mason version of A Star Is Born shares the same essential plot as the 1937 film, but the two movies are actually quite different. The original relies on inside Hollywood details while the remake is perhaps the best film showcase of Garland's titanic talents. 2. Real-life incidents. Norman Maine was probably based on a combination of John Gilbert, John Barrymore, and Wallace Reid, while the disintegration of Esther and Norman's marriage bears similarities to both Frank Fay and Barbara Stanwyck and silent film stars John Bowers and Marguerite De La Motte. The chaotic funeral scene is very similar to what Norma Shearer encountered after the death of her husband, MGM producer Irving Thalberg. 3. Locations. A Star Is Born provides a glorious Technicolor tour of several Hollywood landmarks, including Grauman's Chinese Theatre, Santa Anita racetrack, and the Hollywood Bowl. 4 Gaynor. If you only know the actress from her work in silent films like Sunrise (1927) and Seventh Heaven (1927), she is a revelation here, especially her wickedly funny imitations of Greta Garbo, Katharine Hepburn, and Mae West. Other critics: A Star Is Born has an 100 percent fresh rating at Rotten Tomatoes and Leonard Maltin writes that "two remakes haven't dimmed the glow of this drama" in a three and 1\2 star review for his Classic Movie Guide. Critics in 1937 handed in rave reviews. Frank Nugent of The New York Times wrote that the movie was "good entertainment by any standards, including the artistic, and convincing proof that Hollywood need not travel to Ruritania for its plots; there is drama aplenty in its own backyard." Variety predicted big box office: "A smash which unquestionably will rate among the half dozen best of the season." The bottom line: Maltin is right: Two remakes haven't dimmed the appeal of the original version of A Star Is Born. Watch it for an entertaining slice of old Hollywood history and the glorious Technicolor scenery. Availability: A Star Is Born will air at noon Feb. 25 on TCM. It is also available for streaming on Fandor and on DVD, Blu-ray, and video on demand. Next week, I'll begin the February theme of the leading ladies of Cary Grant with he and Irene Dunne playing a squabbling couple in The Awful Truth (1937).